The visitor to the Big Bend will appreciate and understand this great National Park much better if he has a general grasp of the geologic framework of the land. So it is appropriate to discuss briefly a few geologic principles and explain a few geologic tools. 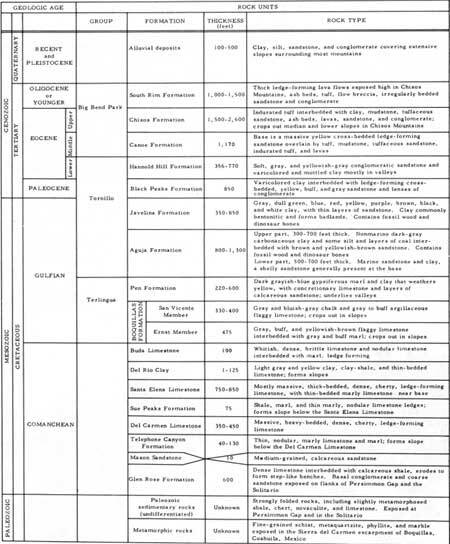 Geologic terms are defined in the Glossary. From the beginning of historic time, Man has known the sea as a barrier, a broad highway connecting distant continents, and a source of food. However, only recently has he appreciated the role of seas in the formation of rocks. In our day about 29 percent of the earth's crust stands above the ocean surface, which averages about 2 miles in depth. Like the continents, the ocean floor has many irregularitiesbroad sloping surfaces normally extend from the shore lines toward the ocean deeps where great submarine canyons, mountain ranges, and volcanic peaks have been mapped. Blanketing the continental slopes are layers of sediments derived from the wasting of rock materials found on the adjacent land. Normally there is a pattern of sediment deposition: sand is deposited along the beach and in offshore bars, mud finds a resting place a little farther out, limy precipitates settle out of solution in the quiet water beyond the mud. All of these sediments may contain the fossil shells or other hard parts of animals that lived in the sea, for when the animals die, their bodies sink to the bottom and, when buried, some of the shells and hard parts may become replaced with minerals (petrified). Although the major ocean basins have occupied their present locations through most of geologic time, some seaways have shifted about as the earth's crust buckled, rose, and subsided, and many times in the past broad shallow seaways submerged vast areas of the continents. When a shallow continental sea retreated due to uplift of the continent, the terrain was normally low and swampy, and it was in the swampy environments, where there was a lush growth of vegetation, that the coal beds were formed. In some places, like the mid-continental United States, the sea left a thick succession of bedded, marine, fossiliferous sandstone, shale, and limestone deposits on the land. In other places, normally along deep troughs where the deposits were thickest, the earth became unstable and the rocks were folded, broken by faults, and uplifted to form high mountain ranges. Where the continent was raised high above sea level, sediments derived from the weathering and erosion of rocks in the highest areas were deposited on the adjacent plateaus and plains. These continental deposits differed in character from those deposited beneath the sea. The materials are poorly sorted and the bedding indistinct; ripple-marks, mud cracks, cross-bedding, cut-and-fill features made by ancient streams are common, and occasionally animal tracks are preserved. Where the rocks are coarse, massive, poorly sorted sandstone or conglomerate, the existence of adjacent highlands is inferred. Broad mud flat (clay) deposits enclosing long slender bodies of sand indicate extensive lowlands with meandering streams. Sand dunes are evidence of arid climate where there was little or no surface drainage. Volcanic ash and extensive lava flows record volcanic episodes. Many rocks of continental origin, whether they be ancient sand dunes, volcanic ash, or deposits along the flood plains of mighty rivers, contain fossils. The most common types are fossil logs, twigs, and leaves; bones, plates, and teeth of land animals; shells of fresh-water clams and snails; and fish bones. The fossils give clues as to whether forests, shrubs, or ferns were the dominant vegetation and if the climate was cold, hot, arid, or humid. The bones indicate not only the size of the animal but also if it lived on land or in the water. The teeth classify the animal as to food habitscarniverous or herbiverousand if a vegetarian, whether the dominant food was the grasses or lush river bottom swamp vegetation. The geologist studies all the physical features found in the rocks, including the type of rock, mineral content, size of grain, color, bedding (horizontal or tilted), depositional structures (cross-bedding, ripple marks, mud cracks), and fossils. These are the tools by which he reconstructs the depositional environment, climate, the rock's place in geologic time (age), and the succession of events in the geologic history. The geologist is a detective who looks for clues in the world of today in order to understand what occurred in the past. Geologic time can be compared to a history text. It is divided into five eras (chapters), many periods (pages), and epochs (paragraphs). This record is called the geologic time scale (fig. 5). If a chapter or part of the pages from a history text are missing, the continuous record is broken and the reader must get another book to obtain the full account. In most places, the geologic record is similarly broken and the geologist must go to a different area, or sometimes another continent, to complete the geologic story. The rocks belonging to the two oldest eras of geologic history have been greatly modified by intense heat and pressure. For the most part, these old rocks tell only of the origin and erosion of ancient mountains and the advance and retreat of primeval seas. Only in a few places do the rocks contain the earliest traces of life. These are: (1) carbon that probably is of organic origin, (2) some rounded rock masses that are probably algae reefs, (3) worm tubes, and (4) a few impressions of jellyfish-like animals. Rocks of these ancient eras do not occur in the Big Bend, but part of the sequence is exposed to the north near Van Horn, near Llano in Central Texas, in the bottom of the Grand Canyon, in the Lake Superior-Hudson's Bay area, and in other parts of North America. Because these ancient rocks are not known in the Big Bend. 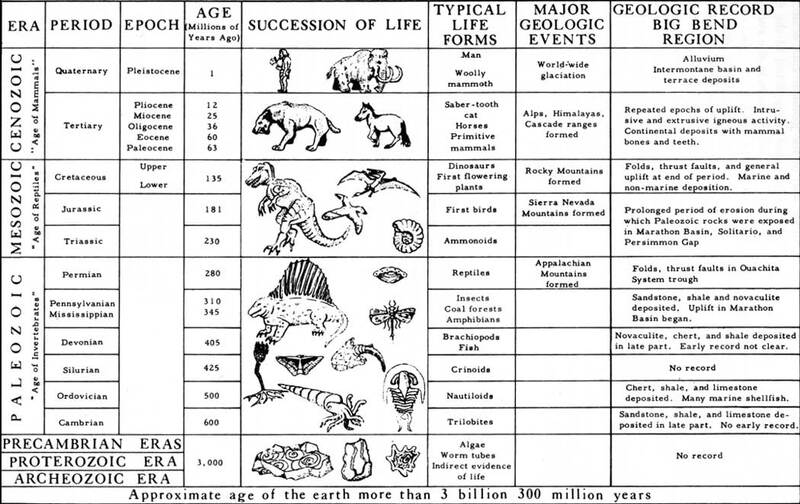 the writer has simplified the oldest part of the geologic time scale (fig. 5) and included more detail of the three younger eras which include the rocks exposed in the Big Bend. Paleozoic Era.The oldest rocks in the Big Bend belong to the Cambrian Period of the Paleozoic Era (fig. 5). At the beginning of the Cambrian, some of the animals had developed shells or hard parts so that a continuous fossil record began. Since then, there has been a procession of different life forms across the pages of geologic history. 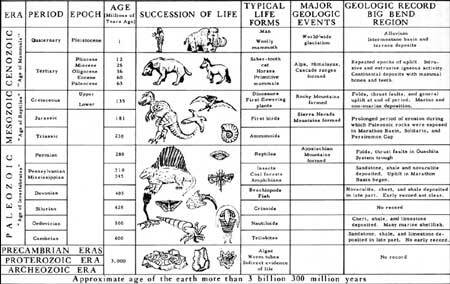 The oldest animals included floating, crawling, and swimming creatures in the sea, later there were flying creatures in the air, and dinosaurs, trees, and shrubs were on the land; mammals, grasses and flowering plants are mostly younger. It may be difficult for some to accept the fact that the sea once covered the Big Bend, but fossil shells, ripple-marks, and current structures found in some of the sedimentary rocks indicate that the sea did cover the area. Coal beds prove that swamps were present during a part of the yesteryear; fossilized tree trunks, 10 feet or more in diameter, and palm fronds show that ancient climates differed from those of today; bones of the early horse indicate the previous existence of grass-covered plains. 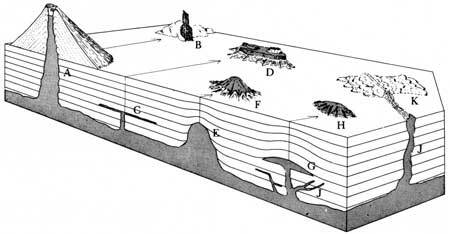 During most of the Paleozoic Era, three great sea troughs bordered the interior of the continental platform (fig. 6); much of the time they received large quantities of sediments from adjacent highlands, but periodically shallow seaways also covered most of the platform's interior; only a few places in North America were not covered at least once during this era. In late Paleozoic time, movements within the earth's crust began buckling the newly formed rocks and by the end of the era, belts of deformed rocks bordered the continent where once the depositional troughs extended. The Appalachian Mountains lay to the east, and the folded rocks of the Ouachita System, locally exposed in the Big Bend, flanked the continent on the south (fig. 6). These newly formed structures were elevated to form mountains and were attacked by erosion; in the Ouachita System (Big Bend area), the highland was reduced to low hills. In the next younger era, the Mesozoic, the area was submerged by the Cretaceous sea and the mountain remnants were covered by a thick blanket of Mesozoic rocks. Later erosion exhumed isolated areas of the old Paleozoic highland, and vestiges of the ancient mountains are now exposed in the Marathon Basin, the Solitario, and in the Park at Persimmon Gap. Flawn et al. (1961) described the rocks in great detail and showed that the mountain structures are covered east of the Marathon Basin but crop out again in south-central Oklahoma, southeastern Oklahoma, and Arkansas and are deeply buried beneath much younger rocks in the Mississippi River valley. Primitive fossil sponges are abundant in some of the Cambrian rocks (fig. 7A), and brachiopods, or lampshells (fig. 7B), were numerous. However, the trilobites, a crustacean that in some ways resembles lobsters and crabs, were the most successful Cambrian life group (fig. 7C). In the Ordovician, the next youngest period, the corals appeared, and there were also snails, clams, nautiloids, starfish, and a great many more brachiopods (figs. 8, 9). The graptolites, a floating colonial plant-like animal (whose remains look like "writing in the rocks"), were abundant (fig. 9B). In the Silurian (fig. 5), most of the life groups increased in variety of types and number but the trilobites and graptolites declined. The first vertebrates, a jawless armored fish (fig. 10), appeared, and at the close of the Silurian, the drama of life moved to the land. The first land plants were seaweed-like types that clung closely to the tidal marshes. These plants evolved into ferns, leafy plants, and a variety of tree-like shrubs that clothed the swamps and low lands. It was this late Paleozoic (Pennsylvanian Period) vegetation that gave rise to the coal deposits that extend much of the distance from Illinois eastward to Pennsylvania and in North-central Texas. There were also a variety of large insects associated with the swamp vegetation. Toward the end of the Paleozoic Era, the lungfish developed a respiratory system; it was then only a step to the amphibians that lived both in and out of the water (fig. 11) and eventually to the dinosaurs that reached prominence in the Mesozoic Era.2 Dinosaur remains are found in the Big Bend. 2Life published (Barnett, 1962, Vol. I, pp. 92-110) an excellent non-technical story (with illustrations) on the pageant of life, Matthews (1960) described and illustrated Texas fossils. FIG. 7. Fossil shellfish. A, B, from Matthews (1960). C, artist's sketch. FIG. 8. 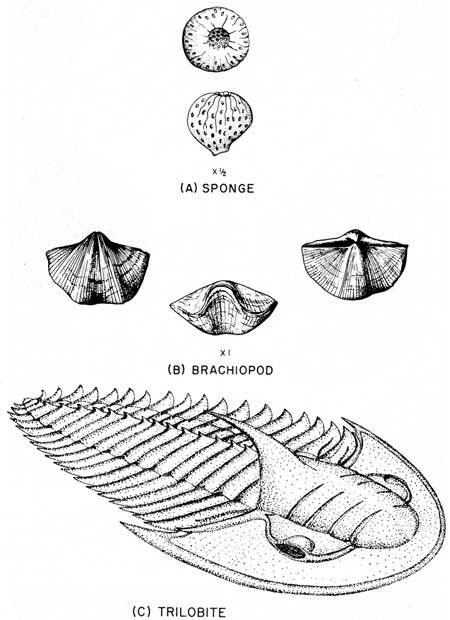 Fossil shellfish (Matthews, 1960). FIG. 9. 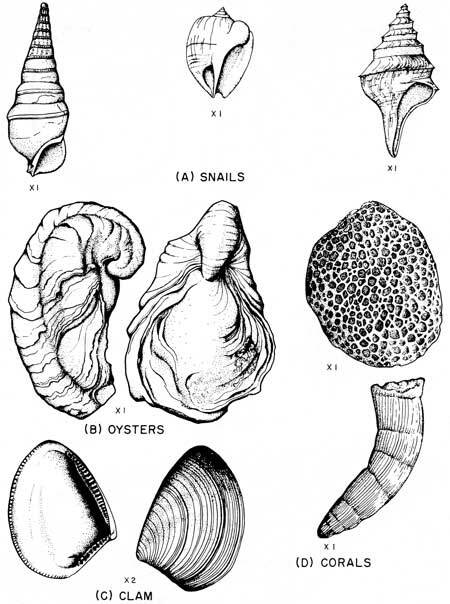 Fossil shellfish (Matthews, 1960). FIG. 10. Primitive armored fish (Matthews, 1960). FIG. 11. Primitive amphibian (Matthews, 1960). Mesozoic Era.The Mesozoic seaways differed in position and outline from the areas of Paleozoic deposition (fig. 12). The oldest rocks were deposited in a trough that extended from near the city of Chihuahua, Mexico, northward into Hudspeth County, Texas. Later there was deposition farther north, and during the Cretaceous Period of the Mesozoic, the sea overflowed the sides of the trough and the water extended eastward into the Big Bend country, where it covered the highly deformed Paleozoic rocks in the Ouachita System (fig. 5). The basal Cretaceous rocks in the Big Bend are coarse sandstone and conglomerate deposited along the shore line as the early Cretaceous sea advanced northeastward across the area. Following the initial submergence, the waters cleared and great thicknesses of massive limestone were deposited. These rocks include the Lower Cretaceous Glen Rose, Del Carmen, and Santa Elena Formations now exposed in the Sierra del Carmen, and the Del Carmen and Santa Elena Formations exposed at Sierra San Vicente, Mariscal Mountain, Mesa de Anguila, and the Christmas Mountains (fig. 4) (in pocket). The sea was teeming with life but a different life than that found in the Paleozoic rocks. The graptolites and trilobites were gone and new genera and species of clams, oysters, snails, corals, and many floating microscopic forms appeared (figs. 7, 8, 9). Some of these were the ancestral forms of the shellfish found in the present oceans. 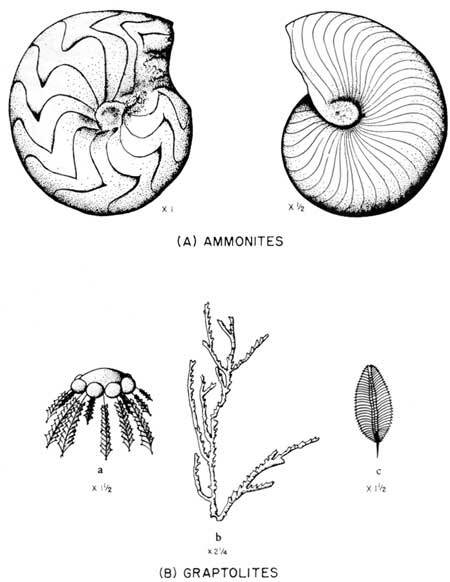 One of the most common shellfish was the ammonite (fig. 9A), a coiled mollusk related to the present-day chambered nautilus. During the early Upper Cretaceous, lime mud deposition prevailed. The rocks are normally flagstone (Boquillas Formation) and shale (Pen Formation) that overlie the massive Lower Cretaceous limestones. All of these rocks contain various kinds of shellfish and there are also marine reptile bones in some of them (fig. 13). Some of the marine reptiles were large fish-like monsters (ichthyosaur and mosasaur) with long jaws, fierce teeth, and fins. Another was the fish-lizard reptile (plesiosaur) having an enormous neck and tail that somewhat resembled a snake drawn through an elongated turtle shell. This creature had paddle-like fins for locomotion and fierce teeth in jaws on a long neck that could lash about to seize prey. Fish were also present and a few fish skeletons and mosasaur bones have been discovered in the Park. Rocks containing some of these specimens may be seen in the lowland west of the Sierra del Carmen and Mariscal ranges (fig. 4). FIG. 13. 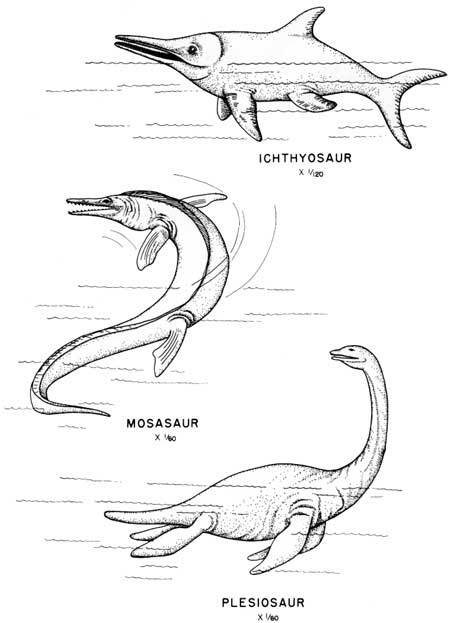 Mesozoic dinosaurs (Matthews, 1960). During the middle Upper Cretaceous (fig. 5), broad warpings within the continent caused the main body of the ocean to withdraw, and dense vegetation, including forerunners of the types that later developed into our modern forests, clothed much of the land surface. Some water remained in the depressions, forming marshes, with a lush growth of ferns, mosses, canes, and water-loving trees. It was in this environment that the giant reptiles lived, fought, and died, and where some of their skeletons were preserved. The meaning of the term dinosaur is often misunderstood. The popular belief that all of the ancient reptiles were dinosaurs is not correct. The dinosaurs include only one group of the reptilian class. The term "saur" is rooted from the Greek word for lizard and "dino" means terribleterrible lizard. Figures 13 and 14 show a variety of the dinosaurs which differ from the swimming and flying reptiles (figs. 15 and 16). FIG 14. 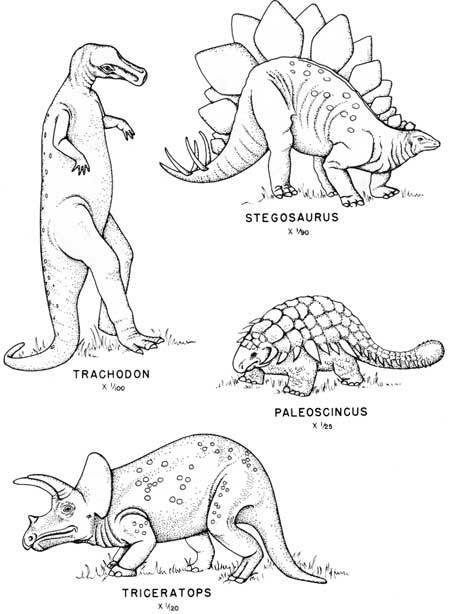 Mesozoic dinosaurs (Matthews, 1960). FIG. 15. Swimming reptiles (Matthews, 1960). FIG. 16. 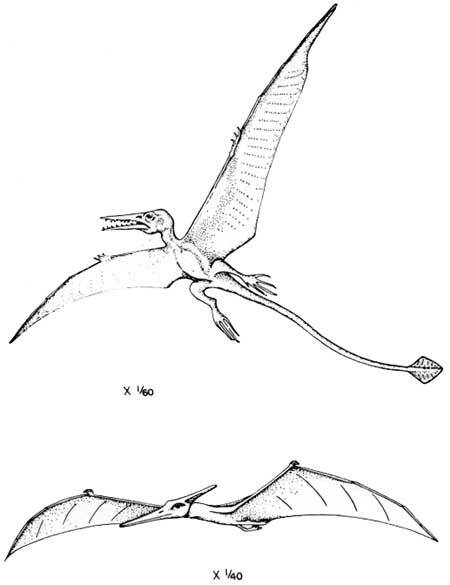 Flying reptiles (Matthews, 1960). 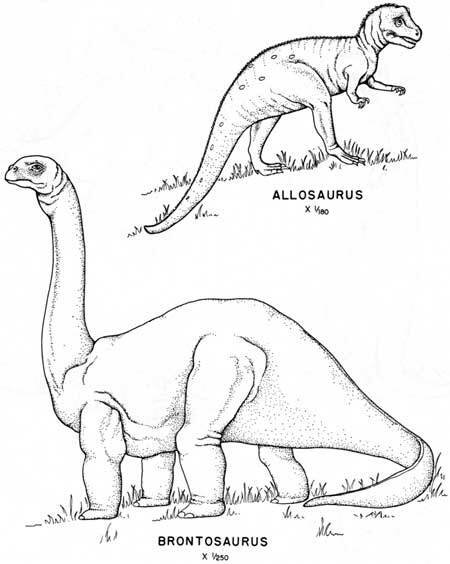 Some of the dinosaurs were herbiverous and required a lush growth of vegetation for their food. Others were carniverous and gorged upon the flesh of both less powerful herbiverous and carniverous beasts. The dinosaurs ranged in size from that of a modern rat or rabbit to giants weighing several tons (figs. 13, 14). The brain cavities in some of the largest beasts were about the size of the brain cavity of a modern house cat. This had led to a popular belief that the dinosaurs had low mentality, probably having only enough intelligence to eat when they were hungry. The dinosaurs, stupid or not, managed to survive through more than 100 million years of geologic time. Perhaps as Jepsen (1964, p. 234) has reported, "Brains are like purses; contents are more important than size." The fossil record in the Big Bend indicates that several species of ancient reptiles, including some dinosaurs, were present. 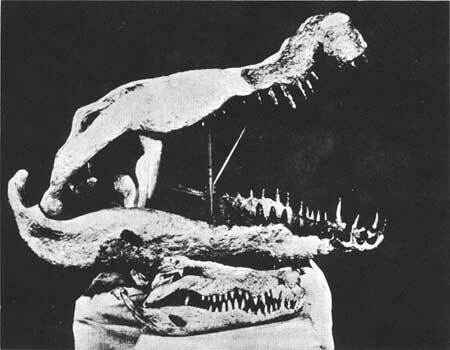 Two skulls of a crocodile-like monster, Phobosuchus riograndensis, have been collected; one is preserved at the American Museum of Natural History (fig. 17) and the other is at The University of Texas, at Austin. The skeletal remains of the duck-bill dinosaur, ceratopsian bones (similar to the familiar Triceratops), and some of the large carniverous types have been discovered (figs. 13, 14), but only a few bones of the bird-like reptiles have been found (fig. 16). Jawbone fragments and teeth of the swimming reptiles (fig. 15) are also present. In the Upper Cretaceous formations, closely associated with dinosaur bones, are fossil stumps of agatized wood, the roots of which are still emplaced in the sandy lagoon deposits in which the trees grew (fig. 18). In some places, groups of fossil logs suggest "log jams" that were covered with mud and preserved. Fossil turtles have been found in the same rocks, and this association of dinosaur bones, wood, and turtles suggests that the ancient environment was similar to the present-day bayou environment of East Texas and Louisiana. FIG. 18. 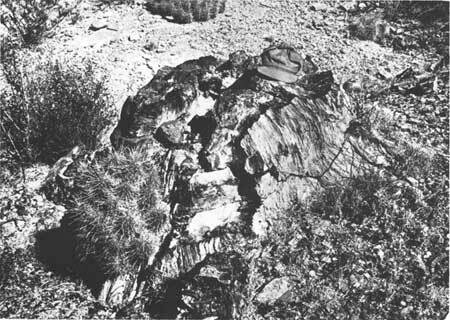 Agatized tree stump with roots embedded in rock that was an Upper Cretaceous soil deposit at the time this tree grew, west side of Tornillo Creek, southern Tornillo Flat. The reptiles (land, sea, and air types), which were numerous during the entire Mesozoic Era and appeared to have been well adapted to the environment, became extinct at the close of the era (fig. 5). One of the deepest mysteries in geologic history iswhy should all the members of so powerful an animal dynasty vanish from the earth at almost the same time? Disease, climactic changes, and starvation (because the Cenozoic climate favored a continental flora) have been suggested for their extinction. Other writers have suggested over-specialization (size, shape, and armor) that resisted the modifications necessary for survival. Finally it has been suggested that the mammals, which emerged during the late reign of the dinosaurs, were responsible for the extinction. Although the early mammals were small, they were active and probably had more mental vitality than the dinosaursperhaps the mammals destroyed the dinosaur eggs, feasted upon those individuals that could be preyed upon, and eventually caused extinction. Jepsen (1964) and Barnett (1962, pp. 102-110) have discussed the mysteries of the dinosaurs in more detail. The end of the Mesozoic Era witnessed the general uplift of the North American continent and the development of mountains in many places. The Rocky Mountain system in the Cordilleran area is the most prominent feature in the United States and the Sierra Madre ranges in Mexico are of the same age. The Big Bend country lies between the two major mountain ranges and although the area is mountainous, the uplifts are not as high as either the Rockies or the Sierra Madre ranges. Nevertheless, some of the rocks were twisted, broken, and crumpled, and the ridges represented by the Santiago and Mariscal ranges and lower ridges along a northwest-trending belt through the Chisos Mountains were formed at this time (fig. 4). Cenozoic Era.Following the uplift and mountain-building epoch at the close of the Mesozoic Era, North America stood largely above sea level. Cenozoic seas covered only the continental borders, much like the Gulf of Mexico laps onto the Gulf coast today. 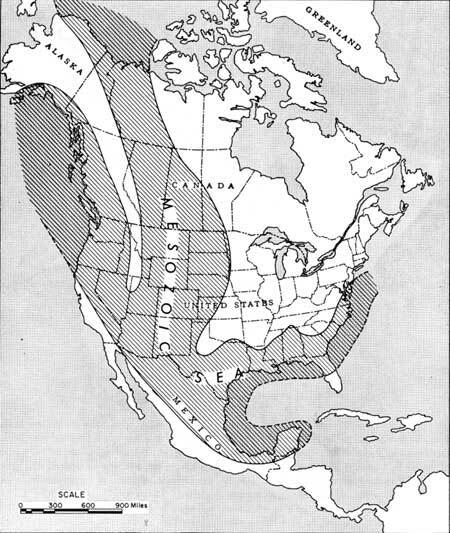 Thus, extensive land surfaces existed in most of North America during the Cenozoic, and as time progressed, the continent approached more and more closely its present outline. 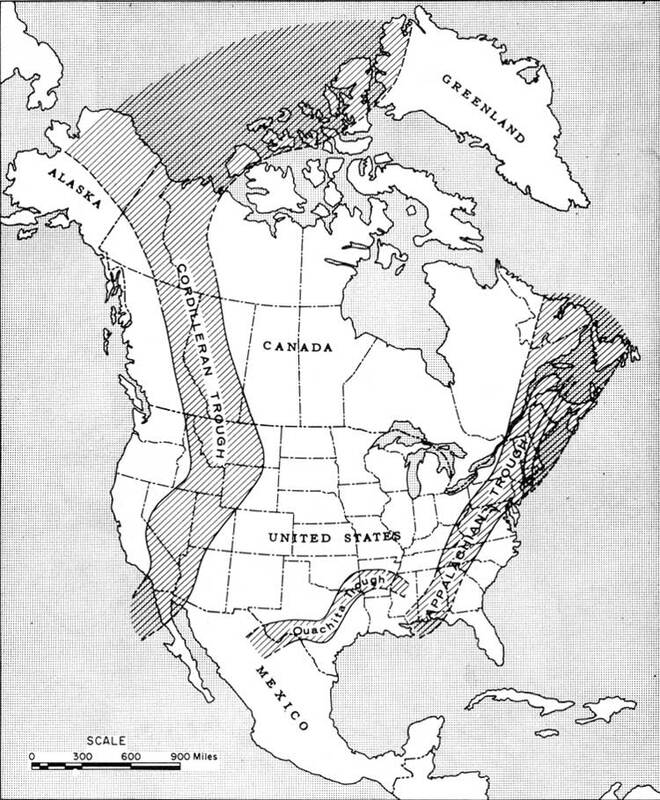 The western one-third of the United States was a region of great crustal adjustment during the Cenozoic. The Rocky Mountains were rejuvenated (fig. 6) and as erosion reduced the rocks in the mountains, the streams deposited extensive blankets of continental debris in the Great Plains. In the Great Basin area, the rocks were broken by faults and tilted, forming long subparallel block mountain ranges (fig. 19). There was no through river drainage and as erosion reduced the highlands, the streams deposited their loads in the intermontane basins, filling some of them to great depths and burying many of the lower ridges. Igneous activity provided great masses of both intrusive and extrusive rocks; the Columbia River lava beds are of this age and great stacks of lava and volcanic ash are found at many places in the southwestern United States, including the Big Bend, and in western Mexico. Hot molten rocks were pushed upward into the higher parts of the crust in many areas and are conspicuous in the Big Bend. The Cenozoic climate was mild and moistcereals were highly developed and grasses clothed most of the land surface. It was during the Cenozoic, with its moist mild climate and lush grass-covered surface, that the mammals rose to their high stage of development (fig. 20). FIG. 19. Elongate blocks of the earth's crust that have been broken and tilted by faults. The diagram shows the relative up-and-down movement in cross section, the tilted beds in the upthrown block, and the uneroded escarpment of the upthrown block where it crops out and is exposed on the surface. FIG. 20. 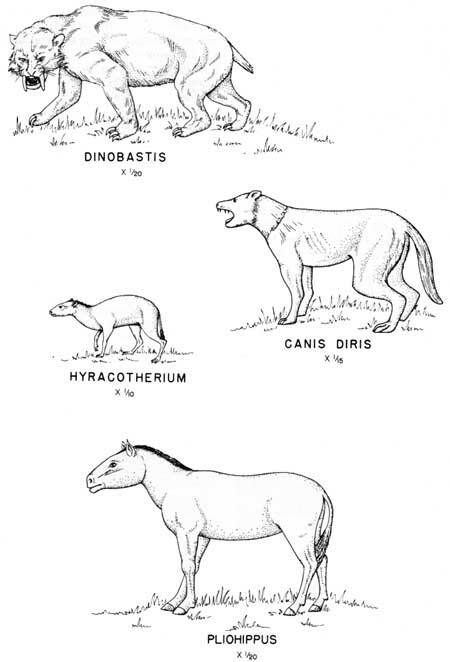 Some of the Cenozoic mammals (Matthews, 1960). Rocks that were deposited during the Cenozoic Era in the Big Bend crop out on part of Tornillo Flat and the Chisos Mountains in the Park (fig. 4) and farther northwest in the Bofecillos Mountains in eastern Presidio County and north in the Davis Mountains (fig. 1). The oldest Cenozoic Park rocks are predominantly continental sandstones, conglomerate, clay, variable amounts of volcanic ash mixed with clay, indurated beds of almost pure volcanic ash, lava, and intrusions. The oldest of these rocks are sandstone and clay locally exposed on Tornillo Flat, and they contain the fossil remains of mammals that came into prominence following the extinction of the dinosaurs. The oldest mammal remains known in Texas were found in the Black Peaks Formation (table 1, p. 27) on Tornillo Flat and include Ptilodontidae cf. Mimetodon douglassi, Psittacotherium cf. P. multifragum, Tetraclaenodon puercensis, Periptychus carinidens, Claenodon cf. C. procyonoides, and Phenacodus cf. P. grangeri. All of these are extinct forest-dwelling animals that have no modern counterparts. In the overlying Hannold Hill Formation, Phenacodus cf. P. primaevus, a panther-like cat, Coryphodon sp., hippopotamus-like, and Hyracotherium, the dawn horse, have been collected. The Canoe Formation, the youngest rocks on Tornillo Flat, contain the fossilized remains of Helohyus cf. H. lentus and Hyrachyus sp. The former is a tapir or pig-like animal and the latter is rhinoceros-like. The basal Chisos Formation (near Castolon) has yielded Uintacyon sp., a dog-like mammal; younger rocks contain Archaeolagus sp., a rabbit; Stenomylus cf. S. crassipes and Oxydactylus cf. O. gibbi, both camels, Nanotragulus sp., a small deer; and Hypsiops cf. H. luskensis, a grazing sheep-like mammal. Matthews' (1960) handbook on Texas fossils explains how to find, collect, and identify fossils, and many of the forms illustrated by him are found in the Big Bend. 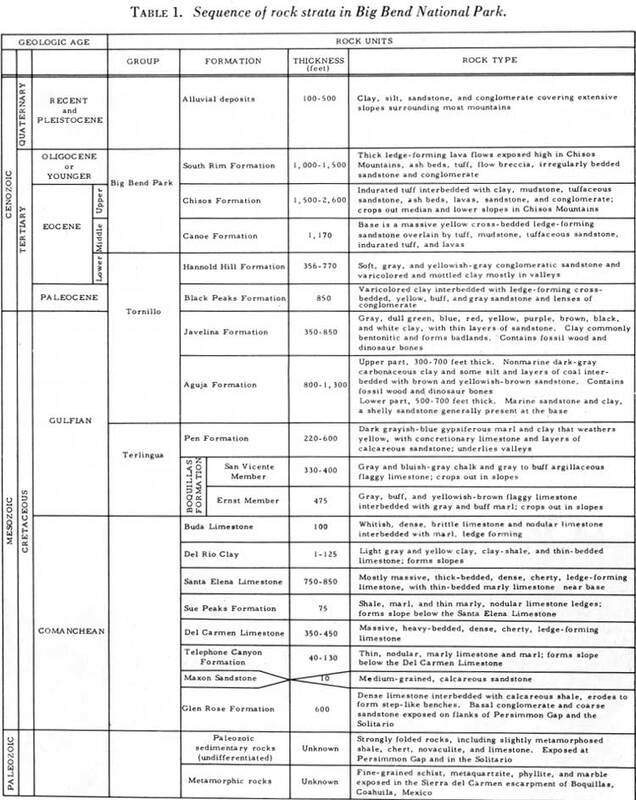 Some of the rock and mineral specimens described by Girard (1964) are also found in the Big Bend. 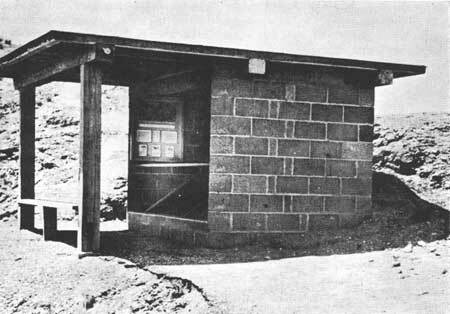 Visitors to the Park probably will not be fortunate enough to find skeletal remains of any of the mammals mentioned above because searching for them demands skill and experience, but some of the bones, jaws, and teeth of the specimens already found have been preserved in a glassed-in shelter about 100 yards south of the Park road one-fourth mile east of the upper Tornillo Creek bridge (fig. 21). FIG. 21. Exhibit shelter containing some of the Mesozoic mammal bones found in the Park. The exhibit is on the east side of the Marathon entrance road about 200 yards north of the Tornillo Creek bridge. The geology of the Park is complex. There are many different kinds of rocks that appear to be strangely mixed. Cenozoic deformation and uplift took place at several times in the Big Bend. Most of the beds are folded into anticlines and synclines (fig. 22), others are tilted (fig. 23), some stand on end, and a few rock masses have been turned upside down and transported several miles from where the rocks were originally deposited. Between the stages of uplift, erosion reduced high-standing areas, and volcanic ash, ashy clay, sandstone, and lava were deposited in local basins. Some periods of mountain building were accompanied by intrusion of igneous rocks. Large masses of molten rock moved slowly upward through the strata. Those that did not reach the surface cooled and hardened as plug-like bodies in the older rocks (fig. 24). Some spread laterally between beds, here arching the overlying strata to form laccoliths (tackhead-shaped intrusions), and there forming tabular bodies called sills. Molten rocks also filled fractures and cooled as dikes which cut the strata at high angles. A few of the masses reached the surface with explosive violence, spreading ash, cinders, and lava over local areas, but from most of the vents, lava flowed quietly over wide areas without explosion (fig. 24). FIG. 22. Anticlines and synclines produced by folding of layered rocks. The upfolds are anticlines and the downfolds are synclines. FIG. 23. Rocks that are tilted in one direction. The hardest layers are the most resistant to erosion and form ridges. If the angle of dip is low, the ridges are cuestas, which are commonly seen in the Texas Gulf Coastal Plain. If the rocks dip at a high angle, the ridges are hogbacks, as are commonly seen along the east flank of the Rocky Mountains in Colorado. FIG. 24. Sketch showing intrusions and extrusions in cross section and plan views. A, Volcanic neck, the feeder pipe for a volcano. B, Volcanic neck after erosion has removed the cone. C, Sill, sheet of igneous rock that has spread laterally along the beds. D, A sill exposed by erosion. E, Intrusive plug that forced its way upward through bedded rocks. F, The top of a plug uncovered by erosion with upturned beds exposed on the flank. G, Laccolith, a tackhead-shaped intrusion that spread laterally along the bedding and arched the overlying rocks. H, Eroded laccolith exposed at the surface. The dip of the flanking hogbacks is less than in the plug (E, F) that cuts across the bedding. J, Dike, intrusive rock that fills a fissure that cuts across bedded rocks. This fissure filling cuts across the bedding and thereby differs from a sill (C). K, Lava flow that came from a dike feeder fracture, which is the source of most lava in the Big Bend. Table 1. Sequence of rock strata in Big Bend National Park.